Kroy Building Products Classic Manor� Vinyl Railing is the overwhelming choice for those who want architectural beauty without the inconvenience of maintenance. With Classic Manor� Vinyl Railing, you can create the look of traditional and elegant accents to your deck, patio, balcony, roof line or trim. David Fabbo installs many Kroy railings around decks and porches throughout the tri state area. We can help to set your home apart with Kroy railings, decorative cap rail, and contoured top rails, each available in several stylish colors. Kroy performance vinyl railing offers homeowners leading choice of vinyl railing styles and colors complementing any home, deck, or garden, all with the low maintenance and long-lasting good looks you expect from Kroy Building Products - the deck railing leader. Kroy vinyl railing offers a better choice to homeowners. 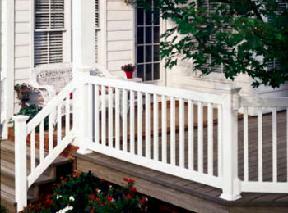 Vinyl and composite outdoor railing products offer the classic look of wood without the upkeep. Vinyl railing products are the smart alternative to wood. They won�t split, rot, fade, or splinter. High-quality vinyl railing materials and precision manufacturing keep the great looks of wood without the work - season to season, year after year. Do vinyl railings become brittle in winter? Vinyl become less flexible in colder weather conditions, such as in New York & New Jersey. However, unless subjected to unusual impact, it will not break or crack. Kroy products have been engineered to accommodate normal temperature swings. Kroy composite railings are unaffected by cold weather. It is normal for vinyl materials to expand and contract during temperature changes. Stevens Home Improvement Company will allow for expansion and contraction during the installation process. Will vinyl crack, chip, peel or rot? During the life of your Kroy product, you should not expect to find surface cracking, peeling, chipping or rot. How long will my Kroy railing last? 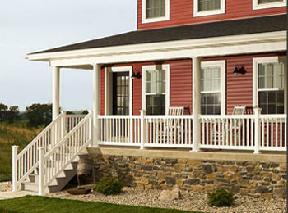 Vinyl railings from Kroy Building Products are designed to last a lifetime. All Kroy products are backed by one of the industry's best warranties. What is the Kroy Building Products warranty? All Kroy products carry a transferable, limited lifetime warranty, except our Gold Series Ranch Rail fence that carries a 20-year warranty. Are vinyl materials maintenance free? Under normal condition all that is required is an annual washing of the product to keep it looking new. How do you clean a vinyl railing? As with all exterior products, a fence or railing will become dirty when exposed to the elements. 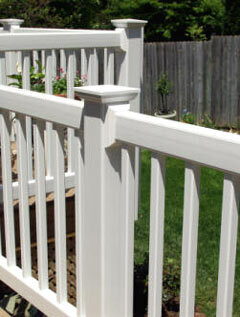 A mild detergent and water solution should be sufficient to keep your fence or deck rail looking new. For tough stains, Soft Scrub or baking soda work well. Simple Green and steel wool also works to clean stubborn stains. Will vinyl fences and railings mildew or collect mold? Vinyl and composite products, when subjected to extended damp weather, will collect mold and mildew. They are, however, easily cleaned with a solution of mild household detergent and water.